All hard surfaces were gravel except our spot along the eastern chain link fence which was dirt and some patches of grass. Level spot. We enjoyed interacting with the owners and staff. They were courteous and helpful. The Cowboy Cafe is a good breakfast spot and we could walk 1/4 mile along the sidewalk to gain access to this great eatery. We also enjoyed dinner at Peppers in town as they served fresh, authentic Mexican food as well as American fare. 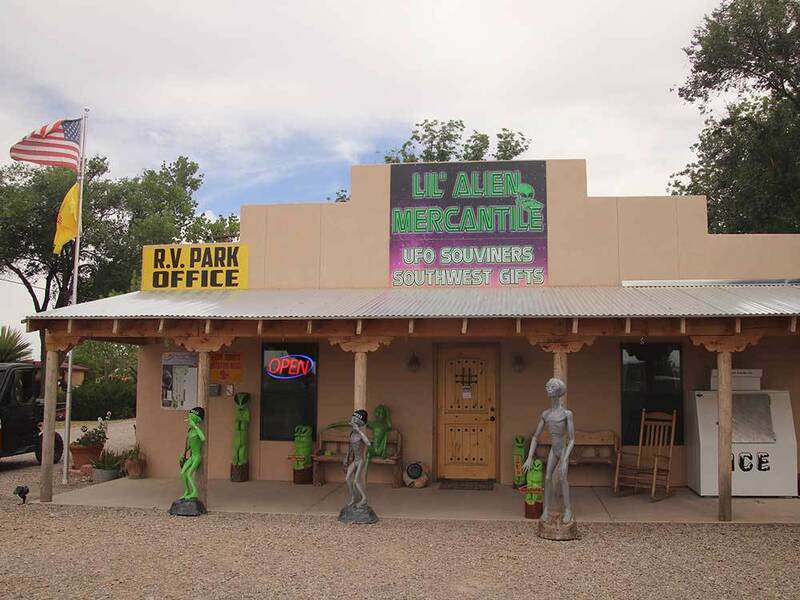 The UFO Museum is a must! We also enjoyed the souvenir shops along main street. Because our RV is short and our stay was only two nights we were given a back-in space (#40) along the eastern perimeter fence. 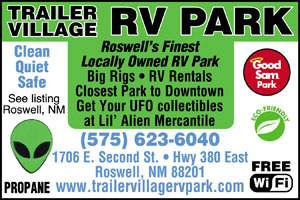 Wonderful little RV park to stay at if you are in Roswell. The owners are wonderful and very friendly. They give good suggestions on things to do in and around the area, and are great people to hang out with around the campfire. The one thing that really stood out to me was the fact that they guide you to your rv spot when you check in, limiting the confusion as to where to go and what direction. Its personal touches like this that really make them stand out above the rest. If you want a good secure location without a lot of noise and seek a friendly, personal touch, then I would suggest this RV Park. I would stay there again if in the area. washer and dryer were a joke... HOT HOTTER and HOTTEST for the washer and the dryer.. the appliances were not maintained.. only one washer avail. out of 3 short sites- the kids took showers and said they were clean - easy to access, rate reasonable. kinda, 10$ extra for each adult. close to town and the ufo stuff.. kids rode their bikes to town and back. seems like a safe area. The smells coming from next door we’re not pleasant, but I can not say enough about how helpful the staff were. End of a long pull for us, misjudged fuel and ran out about 2 miles from park. Staff brought us fuel and guided us to park...never charged us a cent for their rescue! I will be staying in this park again next time I’m through Roswell. Nice enough for an overnight or short stay. Staff is very nice! Facilities are a bit dated but very clean. Internet was a bit spotty, dropped out a few times but we could stream a movie. Spaces are great sized, we have a 15 trailer, but they looked ample for the rigs there. The site is mostly gravel, though, so not too inviting for pets & kids. We pulled in on a Sunday after 5 and most restaurants were closing or had closed, FYI. We stayed at Trailer Village in a travel trailer. The site was pretty level on gravel and close to neighbors. The restroom and showers were clean and adequate. There are no activities or pool there, so be entertained in the town of Roswell during your stay. It was quiet while we were there as there weren't many other campers at the time. I would stay there again.